Increasing incidence of DDT and pyrethroid resistance in Anopheles mosquitoes is seen as a limiting factor for malaria vector control. The current study aimed at an in-depth characterization of An. gambiae s.l. resistance to insecticides in Cameroon, in order to guide malaria vector control interventions. Anopheles gambiae s.l. mosquitoes were collected as larvae and pupae from six localities spread throughout the four main biogeographical domains of Cameroon and reared to adults in insectaries. Standard WHO insecticide susceptibility tests were carried out with 4% DDT, 0.75% permethrin and 0.05% deltamethrin. Mortality rates and knockdown times (kdt50 and kdt95) were determined and the effect of pre-exposure to the synergists DEF, DEM and PBO was assessed. Tested mosquitoes were identified to species and molecular forms (M or S) using PCR-RFLP. The hot ligation method was used to depict kdr mutations and biochemical assays were conducted to assess detoxifying enzyme activities. The An. arabiensis population from Pitoa was fully susceptible to DDT and permethrin (mortality rates > 98%) and showed reduced susceptibility to deltamethrin. Resistance to DDT was widespread in An. gambiae s.s. populations and heterogeneous levels of susceptibility to permethrin and deltamethrin were observed. In many cases, prior exposure to synergists partially restored insecticide knockdown effect and increased mortality rates, suggesting a role of detoxifying enzymes in increasing mosquito survival upon challenge by pyrethroids and, to a lower extent DDT. The distribution of kdr alleles suggested a major role of kdr- based resistance in the S form of An. gambiae. 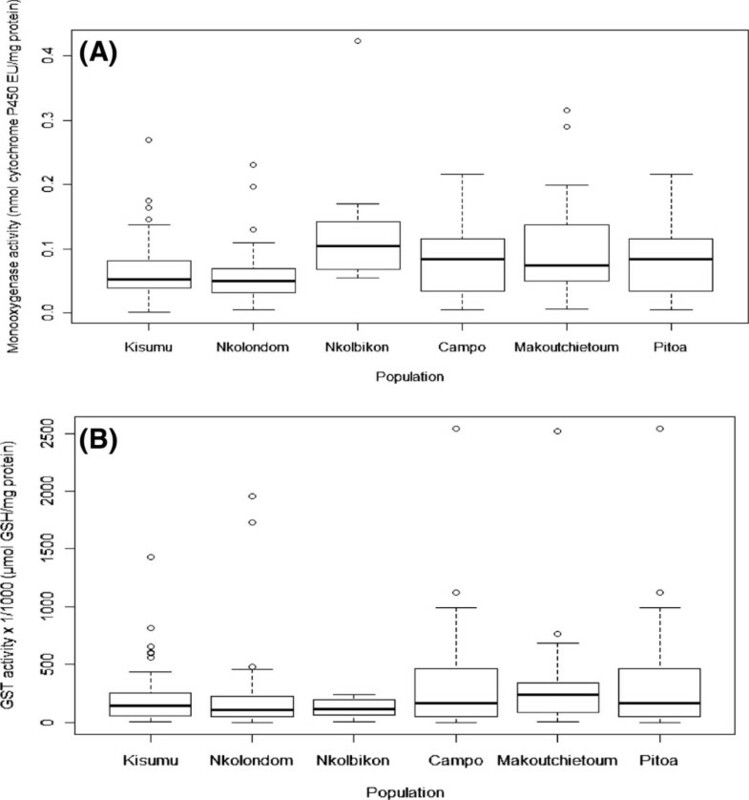 In biochemical tests, all but one mosquito population overexpressed P450 activity, whereas baseline GST activity was low and similar in all field mosquito populations and in the control. In Cameroon, multiple resistance mechanisms segregate in the S form of An. gambiae resulting in heterogeneous resistance profiles, whereas in the M form and An. arabiensis insecticide tolerance seems to be essentially mediated by enzyme-based detoxification. Synergists partially restored susceptibility to pyrethroid insecticides, and might help mitigate the impact of vector resistance in the field. However, additional vector control tools are needed to further impact on malaria transmission in such settings. Vector borne diseases account for approximately 17% of the estimated global burden of infectious diseases and are the major causes of illness and death in tropical and subtropical countries. In most cases, prevention of these diseases relies on vector control, through the use of insecticide treated materials or indoor residual spraying. Although alternative methods include either vaccine or chemotherapy in certain cases, vector control offers the greatest potential for the large-scale reduction of the disease burden. However, the extensive use of insecticides has led to the development of insecticide resistance, making this strategy less effective and limiting the available options for disease prevention and control. For malaria, vector control is chiefly based on the distribution of long-lasting insecticidal nets (LLINs) and/or indoor spraying of houses with residual insecticides (IRS). The use of these methods is substantially increasing in endemic countries in the framework of malaria elimination programmes. Evidence of malaria burden reduction through full coverage of LLINs or coupled with IRS are reported in some African countries[7–9]. In Cameroon, apart from a few laboratory and field trials carried out in certain locations, IRS is not implemented as a large scale malaria vector control measure. However, the National Malaria Control Programme (NMCP) has been scaling up the use of long-lasting insecticidal nets since 2008, with a free mass distribution of 8,654,731 LLINs branded PermaNet® 2.0 and OlysetNet® throughout the country in 2011. This nationwide distribution of LLINs is undertaken in the context where the main malaria-carrying mosquito vectors, including An. gambiae s.s and An. arabiensis are reported to exhibit strong resistance to DDT and pyrethroid insecticides[11, 12]. This situation is a major concern considering the Roll Back Malaria universal coverage objective by 2015. Malaria vector resistance to insecticides in Cameroon is conferred by two main mechanisms: (1) an increase of detoxification and/or metabolism through high levels of multi-function oxidases (MFOs), glutathione S-transferases (GSTs) and non-specific esterases (NSEs)[12, 13] and (2) alterations at site of action in the sodium channel, viz the kdr mutations[11, 14]. The combined effect of target-site insensitivity and metabolic resistance among malaria mosquito populations remains ambiguous. At the present time, questions over the reliability of single kdr genotype in conferring all the variance in resistance phenotype are not unanimously shared in numerous reports[15–18]. Although the impact of kdr-based insecticide resistance on the effectiveness of vector control interventions remains to be clearly demonstrated, the knowledge of all operating resistance mechanisms is crucial for success of vector control strategies. Further investigations are therefore needed to assess the co-involvement of kdr mutations with other mechanisms in the resistance phenotypes that were previously reported in Cameroon. In this study, the susceptibility status of An. gambiae s.l. populations to DDT and pyrethroid insecticides was assessed after exposure to synergists including PBO (4% pyperonyl butoxide), DEF (0.25% S.S.S-tributyl phosphotritioate) and DEM (8% diethyl maleate) which are known inhibitors of MFOs, NSEs and GSTs, respectively in order to explore the involvement of these detoxifying enzymes in the phenotype of insecticide resistance. Molecular analyses were performed in parallel to assess the association between kdr genotypes and resistance phenotype. Biochemical analyses were also performed to assess cytochrome P450 (i.e. MFO) and GST activities in the tested mosquito populations. 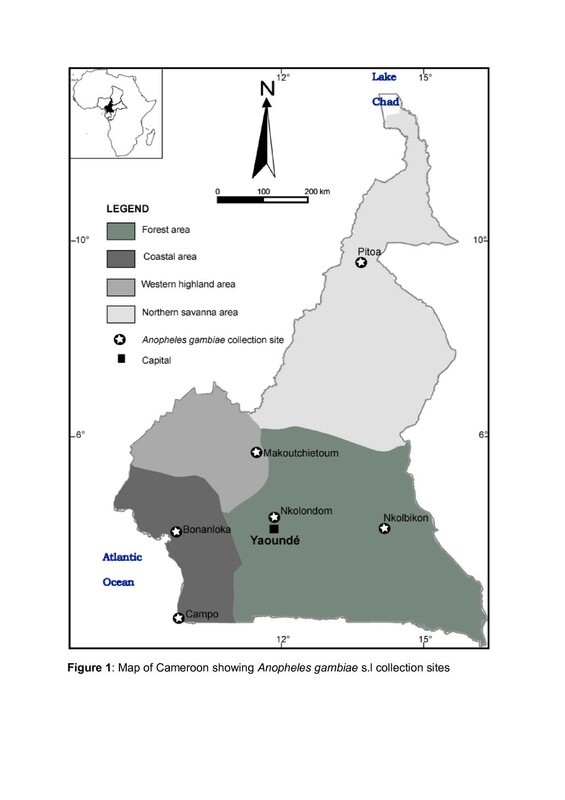 Map of Cameroon showing Anopheles gambiae collection sites. in the northern savanna area, samples were collected in Pitoa (09°23’31”N-13°30’09”E), a locality surrounded by cotton fields and situated at about 15 km from Garoua in the northern region of the country. An. gambiae s.l. larvae and pupae were collected between October 2008 and May 2009. In each collection site, c.a. 30 breeding sites were prospected and larvae were collected and reared locally until adult emergence. Adult mosquitoes were sexed and identified using morphological identification reference keys[20, 21]. Only female An. gambiae s.l. were used for bioassays, as well as molecular and biochemical analyses. The Kisumu susceptible strain of An. gambiae was used as a reference strain to compare the susceptibility level of the field collected samples as well as the activity levels of the tested detoxifying enzymes. Bioassays were performed on mosquitoes aged 2–4 days using WHO susceptibility test kits and standard protocol for adults under ambient room temperature ranging from 25°C to 28°C and relative humidity of 70-80%. Impregnated filter papers with 4% DDT, 0.05% deltamethrin and 0.75% permethrin were supplied by the Vector Control and Research Unit, University Sains Malaysia (Penang, Malaysia). Each full set of bioassays was performed with five batches of 20–25 unfed females: four batches were exposed to insecticide-impregnated filter papers and one batch was exposed to untreated filter paper and served as a control. Tests were concomitantly performed with the Kisumu susceptible reference strain of An. gambiae maintained in OCEAC (Yaoundé, Cameroon) insectaries. The number of mosquitoes knocked down was recorded at 5 minute intervals during the 1 h-long exposure and mortality was determined 24 h post exposure. After completion of the mortality counts, dead and surviving mosquitoes were separately kept on desiccant (silica gel) and stored at −20°C for molecular analyses. Unexposed (control) mosquitoes were also individually kept in 0.5 ml Eppendorf tubes and stored at −80°C for biochemical analyses, together with a batch of unexposed Kisumu specimens. Synergist bioassays were performed on adult female mosquitoes using 3 synergists namely 0.25% S.S.S-tributyl phosphotritioate (DEF, ChemServices West Chester, PA), an inhibitor of esterases, 8% diethyl maleate (DEM, Sigma Milwaukee, WI), an inhibitor of GSTs and 4% pyperonyl butoxide (PBO, Sigma Milwaukee, WI), an inhibitor of oxidases. The preparation of stock solutions for each synergist and impregnation on filter papers (12 cm × 15 cm) were performed in the “Laboratoire de Recherche sur le Paludisme de l’OCEAC (Yaoundé, Cameroon)”. For each test run, two treatments were compared: the insecticide alone versus a combination of synergist and insecticide. It is noteworthy highlighting that during the assay including synergist and insecticide, mosquitoes were first exposed for 1 h to a filter paper impregnated with synergist followed by 1 h exposure to the insecticide. DNA was extracted from each selected specimen using the method of Collins et al. and each individual was identified to the species level and molecular form using PCR-RFLP. This method allows simultaneous identification of the M and S molecular forms within An. gambiae s.s., as well as the other species of the An. gambiae complex. Alleles at the kdr locus were genotyped using hot oligonucleotide ligation assay (HOLA) as described by Lynd et al.. In this study, only mixed function oxidases (MFOs) and glutathione S-transferase (GSTs) activity were evaluated in female mosquitoes aged 2–4 days reared from larvae and never exposed to insecticides but used as control while performing susceptibility tests. Forty-seven specimens were assayed per microtitre plate according to the method described by Hemingway. The knockdown times for 50% and 95% of tested mosquitoes (kdt50 and kdt95) were estimated using a log-time probit model. Mortality rates were compared between bioassays performed with insecticide alone and after pre-exposure to synergists using Mantel-Haenszel chi-square tests. The rate of suppression of knockdown effect by synergists (kds) was computed as described by Thomas et al. with effective values above 10%. Biochemical assay data (enzymatic activity per mg of protein) of wild specimens of An. gambiae s.l were compared to the Kisumu susceptible strain using Wilcoxon rank sum test and all computations were performed using R software (Version 2.15.2, R Development Core Team 2005). A total of 80 susceptibility tests were performed, including 12 tests with mosquitoes of the reference susceptible strain Kisumu (e.g., 3 tests with DDT, permethrin or deltamethrin alone and 9 combinations whereby mosquitoes were first exposed to the synergist DEF, DEM or PBO then to the insecticide at the diagnostic dose) and 68 tests with wild samples. Because of low sample sizes in Nkolbikon, some synergist-insecticide combinations could not be performed: DDT was only tested alone and after initial exposure to DEM and mosquitoes exposed to DEM were not tested for susceptibility to the pyrethroids permethrin and deltamethrin. Throughout the assays, the Kisumu strain of An. gambiae displayed mortality rates above 99% for the 3 insecticides, with no impact of pre-exposure to synergists (Figure ;2). The kdt50 values were 19.1, 9.5 and 8.8 minutes for DDT, deltamethrin and permethrin, respectively; the corresponding kdt95 values were 29.8, 17.3 and 14.6 minutes, respectively and the rates of knockdown time suppression (kdts) were less than 10% in all cases (not shown). Mortality rates in Anopheles gambiae 24-hours post exposure to 4% DDT (Blue), 0.75% permethrin (Red) and 0.05% deltamethrin (Green) with and without pre-exposure to synergists. (A): No pre-exposure to synergists; (B): Pre-exposure to DEF; (C): Pre-exposure to DEM; (D): Pre-exposure to PBO. * Not determined because the assay was not performed. Field mosquito populations displayed variable levels of resistance to the three insecticides tested (Figure ;2A). High mortality to DDT, permethrin and deltamethrin was observed in the Pitoa sample (mortality rate > 93%) and, to a lower extent, in the Bonanloka sample (mortality rate > 82%) with low, if any, effect of pre-exposure to synergists on both mortality rates (Figure ;2) and kdt50 values (Table1). In contrast, the mosquito population from Makoutchietoum was highly resistant to DDT and permethrin with mortality rates below 40%, and showed reduced susceptibility to deltamethrin. Pre-exposure to synergists significantly increased mortality to the two pyrethroid insecticides but did not affect resistance to DDT in this population (Figure ;2). The kdt50 values for DDT were above 60 min with and without synergists, whereas pre-exposure to DEF, DEM and PBO led to a significant decrease in kdt50 values for both pyrethroid insecticides (Table1). A similar pattern was observed in Nkolbikon and Campo populations, although mortality to DDT also increased significantly after pre-exposure to synergists in the latter, and especially so with PBO (Figure ;2A and D). Finally in Nkolondom, mortality rates to permethrin and deltamethrin were above 95% in all treatments, whereas mortality to DDT was dramatically low and remained below 20% whether or not tested mosquitoes were previously exposed to any of the synergists used in this study. Delta: deltamethrin; Perm: permethrin; PBO: pyperonyl butoxide; DEF: S.S.S-tributyl phosphotritioate; DEM: diethyl maleate; N: sample size; kdT50 and kdT95: knockdown times for 50% and 95% of the tested population; %kdts: percent of knockdown time suppression; CI95: confidence interval at 95%; min: minute. Molecular analyses were performed on 721 specimens that were randomly sampled from among survivors to DDT (N = 417), permethrin (N = 244) and deltamethrin (N = 60). Table2A shows the distribution of species and molecular forms within An. gambiae s.l. mosquitoes that survived exposure to DDT. In all localities, the S form of An. gambiae was amongst the survivors. In Nkolondom, Nkolbikon and Makoutchietoum, it was the only one member of the complex found amongst DDT survivors, with a high frequency of kdr 1014F resistant allele (f > 0.77), presence of the kdr 1014S resistant allele (0.02 < f < 0.23) and low frequency of the 1014L susceptible allele (f < 0.11). A similar pattern was observed in the S sample from Campo. However, the 1014L susceptible kdr allele was predominant in the few S form specimens that survived DDT exposure in Bonanloka and Pitoa (f > 0.63), as well as in survivors of the M form detected in Bonanloka and Campo (f > 0.58) and An. arabiensis from Pitoa (f = 1). A) 4% DDT, B) 0.75% permethrin and C) 0.05% deltamethrin. Table2B and2C shows a similar pattern for permethrin and deltamethrin survivors, respectively. As for DDT, the S form of An. gambiae was widespread amongst permethrin survivors and was found in most study sites. Frequency of the kdr resistant alleles was high in these groups (f (1014F) > 0.81) with no occurrence of the 1014L susceptible allele, except in the S form sample from Bonanloka. Again, the 1014L allele was predominant, and often the only one kdr allele found in M form specimens from Bonanloka and Campo, as well as in An. arabiensis specimens from Pitoa that survived exposure to pyrethroids. In summary, the S form of An. gambiae was widespread and was shown to survive DDT and pyrethroid exposure in most sampled localities. Survival was associated with high frequencies of kdr resistant alleles, especially allele 1014F. In Bonanloka however, the susceptible 1014L allele was found in high frequency in DDT and permethrin survivors and no S form specimen was identified in deltamethrin survivors. M form and An. arabiensis specimens were also identified amongst DDT and permethrin survivors in two and one localities, respectively, with no indication of any correlation with resistant alleles’ frequencies at the kdr locus. To further explore the relationship between genotype at the kdr locus and resistance phenotype, we compared the distribution of genotypic frequencies at the kdr locus in permethrin resistant (i.e. ‘survivors’, N = 244) and susceptible (i.e. ‘dead’, N = 219) mosquitoes. Figure ;3A shows high genotypic diversity in the S form samples, with all possible genotypes being represented in most ‘dead’ samples, whereas paired ‘survivors’ samples were significantly enriched in 1014F homozygotes (p < 0.05). This supports a role of kdr mutations in shaping resistance to permethrin in these mosquito populations. In the Bonanloka sample however, genotypic diversity was much lower, with only two genotypes identified (i.e. 1014L/1014L and 1014L/1014F, Figure ;3A) and no difference in genotypic frequencies between dead and survivors. Low genetic and genotypic diversity was also observed within the M form samples from Bonanloka and Campo (Figure ;3B) with limited differences in the distribution of genotypic frequencies between dead and survivor groups suggesting limited, if any, role of the kdr mutations in resistance to permethrin in these populations. Furthermore, all An. arabiensis mosquitoes analyzed in this study (N = 56) were from Pitoa and were homozygous for the 1014L susceptible allele. Frequency distribution of the different genotypes at position 1014 of the kdr locus in samples of dead and survivor mosquitoes after exposure to 0.75% permethrin. A) An. gambiae S form; B) An. gambiae M form. Colour key to the different genotypes is given in the insert on the right. Leu: Leucine at position 1014 (encoded by allele 1014L); Phe: Phenylalanine at position 1014 (encoded by allele 1014F); Ser: Serine at position 1014 (encoded by allele 1014S). Biochemical assays were successfully performed on samples from 5 out of the 6 studied An. gambiae s.l. populations. Figure ;4A shows the mean level of MFOs activity (expressed in cytochrome P450 units) in field-collected mosquitoes compared to the reference susceptible strain Kisumu. Except in Nkolondom, all sampled populations showed a significantly higher MFOs activity than the susceptible reference strain Kisumu (p < 0.05). In contrast, the level of GST activity in these populations was not significantly different (p > 0.05) from that of the Kisumu strain (Figure ;4B). Mean level of detoxifying enzyme activity in field-collected Anopheles gambiae s.l. from Cameroon. (A) Mixed function oxidases (MFOs); (B) Glutathion S-transferases (GSTs). Kisumu refers to the reference susceptible strain of An. gambiae s.s used as control. This study highlighted the diversity of insecticide resistance phenotypes in Anopheles gambiae s.l. populations from Cameroon. The An. arabiensis population sampled in Pitoa was fully susceptible to DDT and permethrin and showed reduced susceptibility to deltamethrin, as previously reported from this area[12, 19]. On the other hand, resistance to DDT was widespread in An. gambiae s.s. populations and heterogeneous levels of susceptibility to pyrethroid insecticides permethrin and deltamethrin that rarely reached full susceptibility were observed. This is also consistent with previous reports[14, 18, 28]. In many cases, exposing mosquitoes to synergists (i.e. DEF, DEM and PBO, respectively) prior to insecticides partially restored insecticide knockdown effect and increased mortality rates in standard WHO assays, suggesting a role of detoxifying enzymes (i.e. NSEs, GSTs and MFOs, respectively) in increasing mosquito survival upon challenge by permethrin, deltamethrin and, to a lower extent, DDT. Molecular and biochemical investigations further revealed a complex interplay between molecular (i.e., kdr- based) and metabolic (i.e., enzyme-based) resistance mechanisms in mosquitoes surviving insecticide exposure. Table3 shows a qualitative summary of the different putative resistance mechanisms that were evidenced in this study, based on i) synergist bioassays results, ii) detection of kdr resistant alleles and iii) biochemical assessment of detoxifying enzyme activities (e.g., NSEs and MFOs). Multiple resistance mechanisms segregated in the S form of An. 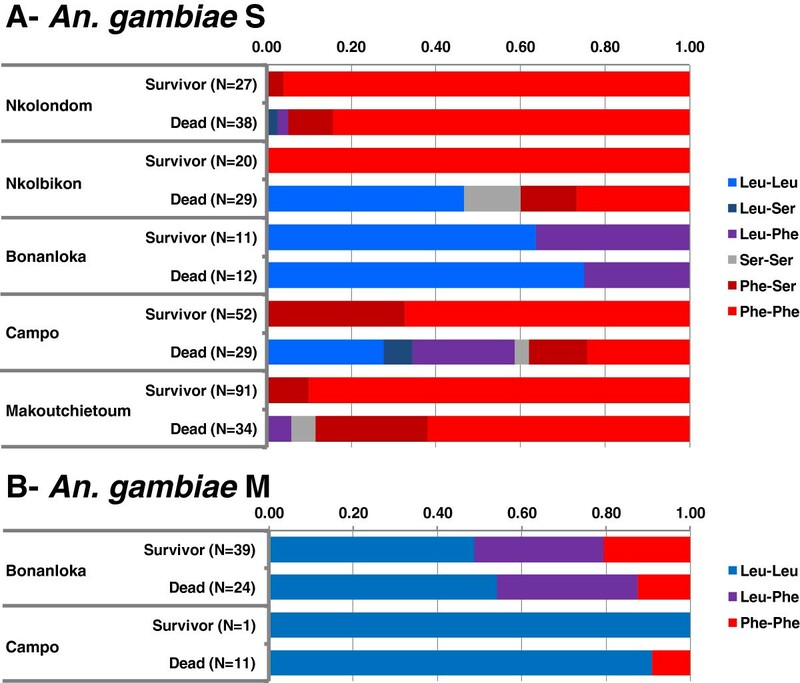 gambiae resulting in heterogeneous resistance profiles, whereas in the M form and An. arabiensis insecticide tolerance seems to be essentially mediated by enzyme-based detoxification. ++: Major role in resistance; +: Presence; -: Not observed in this study; N/A: Not determined. Several approaches may be used to investigate mechanisms of insecticide resistance in a vector population. So far, cross-resistance to commonly used classes of insecticides based on bioassay data has been suggested to depict resistance mechanisms, but this approach does not provide irrefutable evidence when metabolic resistance and target-site insensitivity interact in a particular population. The entry point of an investigation on multiple mechanisms is the co-formulation of synergists with the insecticide to counteract metabolic resistance. Synergists act by blocking metabolic pathways that would otherwise break down insecticides, then restore the susceptibility to the insecticide[30–32]. Using synergists in the current study allowed gaining preliminary information on metabolic resistance mechanisms co-involved with kdr mutations in An. gambiae s.l. resistance in Cameroon. Complete or partial DDT and permethrin resistance suppression was achieved in the presence of the three synergists in the Campo sample, suggesting a major role for metabolic processes in shaping the resistance phenotype of this mosquito population encompassing both An. gambiae S and M molecular forms. In other populations such as in Nkolondom and Makoutchietoum where only the S form survived insecticide exposure, the resistance level to DDT was not affected by synergists, suggesting no role for metabolic resistance mechanisms and a major effect for kdr alleles in shaping resistance to DDT in these populations[18, 28]. 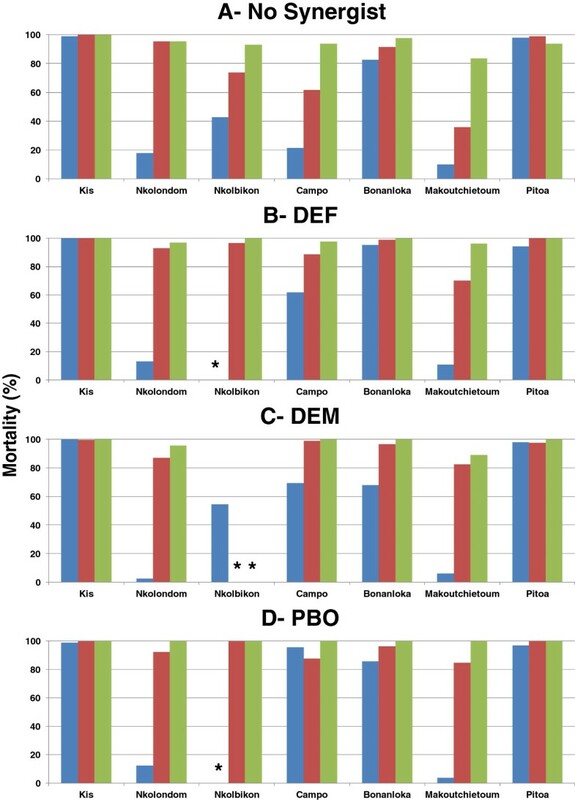 Pre-exposure to synergists, however, restored susceptibility to pyrethroids in Makoutchietoum, reflecting an impact of metabolic processes in pyrethroid resistance, whereas high initial mortality to both permethrin and deltamethrin in Nkolondom suggested absence of metabolic detoxification in this latter population. The synergistic effects of PBO were noticed with all three insecticides (deltamethrin, permethrin and DDT to some extent). These observations are consistent with previous reports on the mode of action and synergist efficacy of PBO[33–36] and agree with a predominant position of PBO in synergizing a wide range of insecticides including organophosphates, carbamates, pyrethrins and pyrethroids[37, 38]. Furthermore, high level activity of cytochrome P450s (i.e., MFOs) was detected in most of the An. gambiae s.l. populations surveyed, confirming their involvement in the phenotype of resistance as revealed by bioassay tests with synergists. These data complement previous reports on metabolic based insecticide resistance in An. gambiae s.s. from Cameroon[12, 13]. Overexpression of P450s enzymes has been found to play a major role in pyrethroid resistance in insects[39–41]; likewise, high level GSTs activity was reported to be associated with insect resistance to DDT and pyrethroids[42–44]. Both bioassay and biochemical data presented in this study are congruent with the first observation but not with the second. The absence of correlation between low levels of GST activity and DDT resistance may be due to the involvement of kdr mutations as the major DDT resistance mechanism in tested mosquito populations. Because it is known that PBO inhibits P450s that mediate resistance to all classes of insecticides[45, 46] and to the well known organochlorine DDT[47, 48], our findings suggest that, when this synergist is associated with deltamethrin, it could be efficiently used for malaria vector control interventions as reported in recent studies[49, 50]. The potent possibility of PBO as an effective synergist for deltamethrin has also been reported against Aedes and Culex genera, suggesting its wide range of action in several mosquito species. Even though the activity of NSEs was not assessed in the framework of this study, bioassay data revealed that DEF was also an effective synergist to suppress pyrethroid resistance in at least some of the An. gambiae s.l. populations sampled. Moreover, in previous studies, NSEs were shown to be inhibited by PBO[51–53] and it is therefore possible that NSEs further contribute to insecticide resistance in Cameroon. However, it is clear that the effects of DEF, DEM and PBO as shown in the current study did not reveal the specificity between each synergist and a given enzyme family. Pasay et al. concluded that, the metabolic routes blocked by synergists are not yet fully understood and may be dependent on the species of arthropods. Hence, further investigations are needed to evaluate the level of involvement of each enzyme family in the overall metabolic-based resistance observed in An. gambiae s.l. populations from Cameroon. The current study revealed the simultaneous presence of multiple resistance mechanisms in the malaria vector An. gambiae s.l. populations from Cameroon, a pattern that likely holds true for most parts of West and Central Africa[54–57]. The co-occurrence and co-implication of both metabolic- and kdr- based resistance mechanisms in An. gambiae s.l is a serious threat to the effectiveness of current malaria vector control operations based on LLINs and IRS. Because malaria is a devastating disease with considerable impact on human health in Cameroon and beyond urgency might require the use of synergists to mitigate insecticide resistance in major malaria vector mosquitoes. However, alternative innovative vector control tools and solutions are urgently needed to complement or even replace insecticide-based strategies in order to face the challenge of global malaria elimination[5, 59]. We wish to thank Bertrand Feshu, Souleymanou, and the communities in our study sites for their help and collaboration in the field. JE and FS conceive the study. JE, FS, RM, and PN designed the study protocol; JE, PN, MC and JCT, performed field work and bioassays; PN and AK have performed molecular and biochemical analyses; PN and JE analyzed and interpreted the data; PN drafted the manuscript which was critically revised by JE, RM and FS. All the authors read and approved the final manuscript.